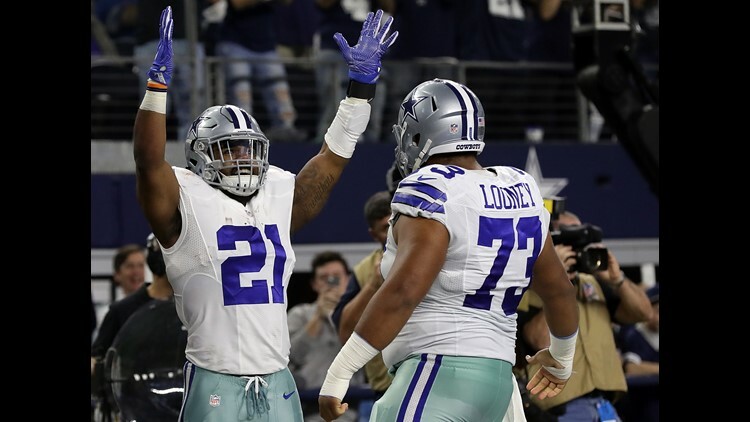 DALLAS — The Dallas Cowboys have no other choice but to turn to Joe Looney as their starting center while All-Pro Travis Frederick remains out indefinitely due to battling Guillain-Barre syndrome. According to COO Stephen Jones, the belief is they can depend on the seven-year pro to handle the snaps while Frederick is away. "We feel good about Joe," Jones said Wednesday at the Flowserve Cowboys Kickoff Luncheon at AT&T Stadium. "I think we do. I think our personnel grouping does. The coaches do, and more importantly, Dak [Prescott] feels really good working with him. So, I think he's a good player for us." Looney is seen as a leader and a player who his teammates have confidence in, according to Jones. The former 2012 fourth-round pick by the 49ers from Wake Forest has been with the Cowboys since the 2016 season; therefore, Looney being seen as a leader in the group is understandable. "I think he fits with that offensive line group," said Jones. "Dak is comfortable with him, more comfortable with him. I think he'll do a good job for us." While there is comfort knowing they have a reliable backup to fill in while Frederick is missing time, now, the team has to replenish their offensive line reserves. Looney was an option to help out along the interior at both of the guard spots and center. With Looney now elevated to starter, the Cowboys will have to look at other team's rosters this weekend to determine who will be able to replace Looney the backup. Dallas was dealt a blow in this regard earlier this month when G/C free agent signee Marcus Martin was lost for the year due to a ligament tear in his right big toe in the first preseason game of the year. Said Jones: "At the same time, we're not naive. We know certainly we're out here looking for offensive linemen, interior offensive linemen, as well as the safety position. So, it's no secret. So, if we can find something that makes sense, we want to improve our football team. "It's ongoing. It won't be over just because the cut's made on Saturday or the team's finished up on Monday. I'll say it again: player acquisition is 24-7." Jones and crew backed up that sentiment as word that they had acquired OG Parker Ehinger from the Kansas City Chief for undrafted free agent cornerback Charvarius Ward came out during their final preseason game against the Houston Texans on Thursday night. Ehinger was a fourth round draft pick by KC in 2016 and could potentially be slotted in as guard or tackle in Dallas. The Cowboys must cut down to 53 players by Saturday at 3:00 p.m. Central Time. Even with Ehinger in the mix, a trade for a traditional backup center could still occur before the deadline. If the Cowboys don't make a trade for a backup, as they did in 2012 when they traded with the Miami Dolphins for Ryan Cook to play center, then they will have to wait until 11:00 a.m. Central Time Sunday to sign players without having to put in claims off waivers. Do you feel like the Cowboys have enough depth on the o-line to survive until Frederick returns or do they need more help? Share your thoughts on the subject with Mark on Twitter @therealmarklane.